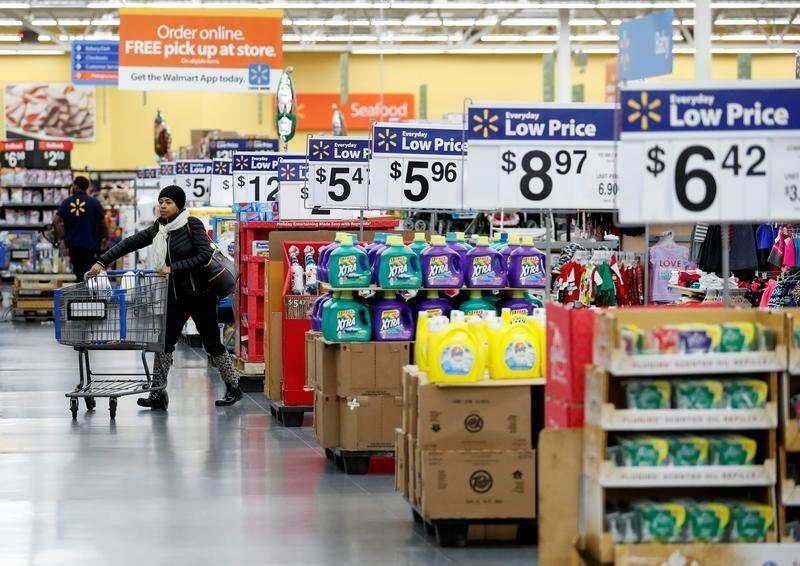 WASHINGTON (Reuters) - U.S. retail sales rose in December amid strong demand for automobiles and furniture, providing further evidence that the economy ended the fourth quarter with momentum and is poised for stronger growth this year. The strengthening economy is causing inflation to perk up. Other data on Friday showed producer prices rising for a second straight month in December, notching their biggest year-on-year gain in just over two years, and consumers starting to anticipate paying more for goods and services. Rising domestic demand and inflation come ahead of expected fiscal stimulus from the incoming Trump administration. That would increase the likelihood of the Federal Reserve raising interest rates at least three times this year, economists said. "This is not the picture of an economy that requires the support of the central bank's policymakers," said Chris Rupkey, chief economist at MUFG Union Bank in New York. "We expect Fed officials to keep with their promise to raise rates two or three times this year." The Commerce Department reported that retail sales increased 0.6 percent last month after rising 0.2 percent in November. Sales were up 4.1 percent from December 2015. They rose 3.3 percent for all of 2016, up from 2.3 percent in 2015. Economists had forecast overall retail sales increasing 0.7 percent and core sales gaining 0.4 percent last month. Despite the unexpectedly smaller gain in core retail sales, the consumer spending trend remains strong. A second report showed the University of Michigan's consumer sentiment index slipped one-tenth of a percentage point to 98.1 in early January. Still, sentiment remained near a 13-year high. Rising wages due to a tightening labor market also are expected to underpin consumer spending this year. Average hourly earnings rose 2.9 percent in the 12 months through December, the largest gain since June 2009, the government reported last week. President-elect Donald Trump's pledge to cut taxes, boost infrastructure spending and relax regulations also is likely to lift economic growth. The dollar (.DXY) was slightly weaker against a basket of currencies, while prices for U.S. Treasuries fell. U.S. stocks were trading higher, boosted by better-then-expected quarterly profits from Bank of America (BAC.N), JPMorgan (MJPM.N) and Wells Fargo (WFC.N). "There is no reason to suspect that consumption growth is going to weaken in the first half of this year," said Paul Ashworth, chief U.S. economist at Capital Economics in New York. "Particularly not when households will be anticipating a potentially big decline in tax rates at some point this year." Friday's data added to surveys on manufacturing and the services sector in suggesting the economy regained speed at the end of the fourth quarter after appearing to lose some ground in November. The Atlanta Fed is forecasting GDP rising at a 2.8 percent annualized rate in the fourth quarter. The economy grew at a 3.5 percent pace in the third quarter. In a separate report, the Labor Department said its producer price index for final demand increased 0.3 percent last month after advancing 0.4 percent in November. "The broad strength in input prices suggests higher inflation is on its way," said Sarah House, an economist at Wells Fargo Securities in Charlotte, North Carolina. Stirring inflation pressures were also underscored by the University of Michigan's survey of consumers, which showed five-year inflation expectations rising to 2.5 percent in early January from a record low 2.3 percent in December. Inflation has persistently run below the Fed's 2 percent target, held back by tepid wage growth, a strong dollar and lower oil prices. Crude prices have since risen above $50 per barrel, which should ease some of the drag on inflation. A 2.4 percent jump in auto sales accounted for much of the rise in retail sales in December. There was also a boost from a 2.0 percent rise in sales at service stations, reflecting higher gasoline prices. Sales at building material stores increased 0.5 percent as did those at furniture shops. Receipts at clothing stores were unchanged. Department store giants Macy's (M.N) and Kohl's Corp (KSS.N) last week reported drops in holiday sales. Those companies have faced stiff competition from online rivals including Amazon.com (AMZN.O). Sales at online retailers jumped 1.3 percent last month after gaining 0.3 percent in November. Americans also spent more on sports and hobbies but cut back on eating out. Receipts at restaurants and bars fell 0.8 percent last month.